Injection capacity 0.5 to 50 oz. Comes standard with gravity fed hopper on thermoplastic machines or a strip fed inlet for Thermoset rubber machines. Injection Molding Machines Tonnage from 30 to 300 tons. Front to back shuttle tables. 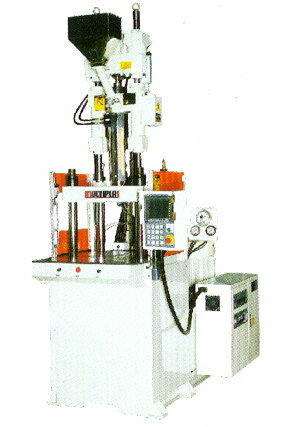 Open architecture of machine design allows for easy access to hydraulics and injection unit. There is also no obstruction behind the plates to allow for core pull cylinders and mold slides. Convenient work surface to assist operator with loading and unloading inserts. Fork lift tubes integrated into the frame for safe, secure method of moving the machine. Single high pressure inject cylinder with 2 polished guide rods for a smooth, accurate injection cycle. Dual clamp cylinders with separate guide rods for even parting line pressure. Allen Bradley or Omron PLC with bright easy to navigate interface screen and symbol coded manual function buttons. Pressures and speeds are set and displayed on screen. Large easy to read pressure guages for quick reference of system pressure, clamp, and back pressure. Standard fixed platen, front to back, left to right shuttle or rotary table.